Available since last year in Japan only, The Witch and the Hundred Knight 2 is finally here in the West, exclusively on PlayStation 4 thanks to publisher NIS America. Now let’s get to the chase early. Yes, it’s the sequel to the original The Witch and the Hundred Knight, but players shouldn’t feel afraid to try it out, as the plot of the game takes place in a completely different world than the first one. Kevala is a desolate continent, whose inhabitants live in fear of the “witch disease” or hexensyndrome, a serious infliction causing the appearance of a third eye in the middle of the forehead of young girls, transforming its host into a witch when the latter ends. to open. And so it is in the remote village of Ecke that we are introduced to Amalie and her little sister, Milm, orphaned since their early youth because of a witch killing their parents. One day Milm disappears and after several hours searching for her, the young girl reappears covered in mud and with the first symptom of hexensyndrome. This results in having both sisters exiled from the village out of fear and finding their lives at the mercy of the disease. We thus are projected in the near future, where Amalie takes her sister to Weiss Reitter, an organization which aims to eradicate witches and the disease and push Milm to undergo surgery and remove her third eye. Sadly the operation goes wrong and turning the younger sister into the witch Chelka, which in turn will transform Milm’s doll into the Hundred Knight. If there is anything that must be praised at first in The Witch and the Hundred Knight 2, it is surely the care that has been given to the world of Kevala, the various settings and of course the storyline which has richer lore than one would expect. It’s no surprise, especially if you’ve played another famed Nippon Ichi Software franchise known as Disgaea, full of bright colours and neat designs, which it easy for everyone to get used to in terms of visual identity. However, the game is not as technically advanced as Disgaea. Although the beginning of the game will undoubtedly enchant you with its mood and an amazing soundtrack, you will very quickly see a bit of simplicity in the 3D sets. The textures are clearly not up to what is possible to expect from a game developed for the PlayStation 4, almost as if we’re in between the latest console visuals and the PlayStation 3. But if that’s not enough, as you advance in the adventure, you’ll have an impression of deja-vu in most regions that make up the world of Kevala. That’s mainly because the game recycles a lot of its elements throughout the game, which could be normal if you are playing procedurally generated title, but it’s not in this case. In terms of gameplay, The Witch and the Hundred Knight 2 is pretty much played like the classic action-RPG: you move your character with the left stick, attack with square, Dodge with X and so on. Yet, there’s the new feature called facets, which are pretty much classes for our Hundred Knight! With up to 3 to equip per level, they change your stats into a precise class archetype like the Power Fortress being the tank or the long-range damage Marginal Gaze. In addition, each facet comes with its own affinities, armour, accessories and types of weapons to be taken into account during your preparations. Finally, note that the death of Hundred Knight results in the loss of some of the items gained during the exploration, so it’s quite a challenging game and greedy players should get used to going back to base often to make sure their precious loot is saved. The reason I’m saying this is because the game can be quite punishing due to the returning mechanic is known as Giga Calories. Obviously having an HP and AP gauge is something to monitor carefully, but the Giga Calories that will decrease throughout the level and will eventually turn you into a weakened state and any damage could instantly kill you. With its quirky scripts, colourful characters, a fun soundtrack and so much humour, I’m pretty Nippon Ichi Software fans will like The Witch and the Hundred Knight 2. But with a very similar gameplay to the first and so much recycled content over the course of the game, I’m not sure if newcomers will really dig this title. 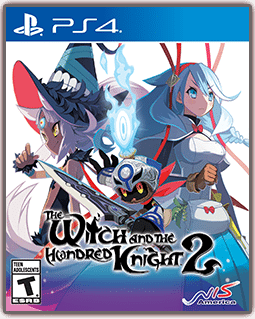 The Witch and the Hundred Knight 2 was reviewed using a PlayStation 4 digital download code of the game provided by NIS America. We don’t discuss review scores with publishers or developers prior to the review being published (click here for more information about our review policy). The Witch and the Hundred Knight 2 is great for the fans of the original, but we can't really recommend this to newcomers due to its repetitive gameplay and subpar graphics.